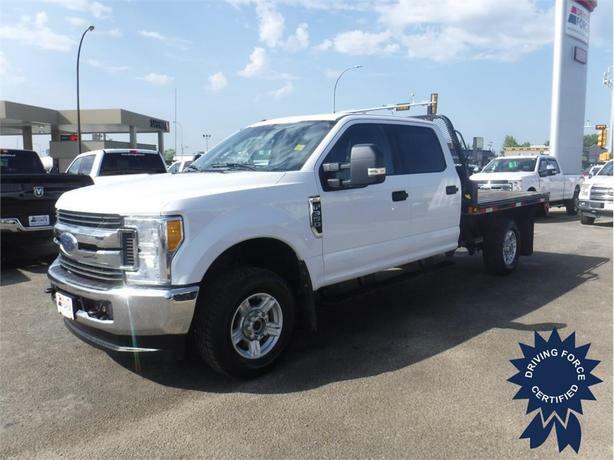 This 2017 Ford F-350 Super Duty XLT Crew Cab 6 Passenger 4X4 8-Foot Flat Deck Truck comes with a 176-inch wheelbase, TorqShift 6-speed automatic transmission with over-drive, electronic-locking with 3.73 axle ratio, 17-inch wheels, black platform running boards, remote start system, XLT Value Package, Class V towing with harness, hitch, brake controller, and trailer sway control, HD shock absorbers, front anti-roll bar, firm suspension, hydraulic power-assist steering, auto locking hubs, 183.6-litre fuel tank, SYNC Voice-Activated Communications/Entertainment, USB port, 911 Assist, AppLink, instrument panel compass display, steering wheel-mounted controls, microphone in headliner, three 12V DC power outlets, power door locks, systems monitor, perimeter alarm, and low tire pressure warning system. The 6.2-litre V8 gas engine provides 385 horsepower at 5750 RPM and 430 lb-ft of torque at 3800 RPM. Touch base with us using our handy web form and one of our heavy-duty truck sales consultants will assist you with any questions you may have.